Welcome to SitcomsOnline Digest! This week, we've got yet another update on the on-again/off-again story of a new season of Community, news of new DVDs of current series, and more. Let's get going! The Mindy Project - Season Two was announced for DVD this week. It will be released on August 19, and will come at a $29.98 MSRP. Also on August 19, you'll be able to pick up Parks & Recreation - Season Six on DVD. It comes at a $39.98 MSRP. In case you haven't spent enough money on August 19, CBS will be releasing The Millers - The First Season on that date as well. This one comes at a $49.98 MSRP. Happy Days - The Fifth Season: After a hiatus of several years, the Fonz (and the rest, of course) return to DVD in this release. The Honeymooners - Classic 39 Episodes (Blu-ray): You can go "straight to the moon" with this release from CBS, which brings this classic series to Blu-ray for the first time ever, along with some new special features. 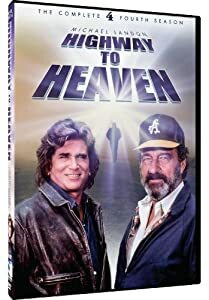 Highway to Heaven - The Complete Fourth Season (DVD, $14.98): The classic "divine drama" from the '80s returns to DVD from Mill Creek, with a release of a season that has never been released on DVD in the United States. Who to Follow: John Ratzenberger (Twitter), "Actor, Clifford Clavin the know-it-all mailman on Cheers, Toy Story's Hamm, Made in America, Dancing with the Stars"
Claim to Fame: Last week, we featured Kirstie Alley here, and we've decided to continue on a bit of a Cheers theme here with our Follow Me. Ratzenberger got his start in a few small movie roles when he sort of stumbled into the role of Cliff on Cheers. Actually, he tried out for the role of Norm, but sensing that wasn't going to happen, he was able to convince the producers to create the character of Cliff. Since Cheers ended, he has done many voices in Pixar films, and has appeared on series such as Sabrina, the Teenage Witch, 8 Simple Rules, and Melissa & Joey. He also had a series on The Travel Channel that ran from 2004 until 2008, Made in America, which put the spotlight on products that were made in the United States and went behind-the-scenes into the production of those products.